The three pillars that make up the foundations of Growth-Link Integrated Solutions are embodied by these words: Connect. Learn. Lead. Each word represents how we work with our clients in crafting solutions that are simple, sustainable and integrated across our three primary offerings in Human Resource Consulting, Individual and Team Assessments and Training and Development. Growth-Link specialises in the development of both people and organisations and we structure our products to ensure that they always map back to this commitment. Our strategy is to work with our clients, allowing them to lead the way so we can learn together and craft solutions that fit their unique needs. Do you want to find out exactly what your business and people need to succeed? Growth-Link Integrated Solutions uses best practice and up-to-date expertise to immerse ourselves in your business and to understand your requirements. Our products are tailored to map back to your specific needs and unique organisational challenges. The strategic offerings we deliver are simple, integrated and complete – every aspect catering for a fast-changing and dynamic workplace and the requirements of teams and individuals. Do you want to truly deliver on the promise of human capital? Growth-Link’s Assessment portfolio has been designed to provide you with valid data so you can make informed decisions about your employees and your business. We assess individuals and teams using tools which are scientifically developed with years of research to back them up. Through our three varied models of Standard, Customised and Unique solutions you can select the optimal assessment model to fit your specific needs. Growth-Link helps our clients to understand their talent management needs as part of an integrated people management approach. We ask the right questions. We analyse the data and the trends. We deliver the right solutions. Looking for an environment which allows for collaboration and communication without barriers? Our Training and Development programmes and workshops have an exceptional reputation across Africa. The frameworks we have developed for, and with, our clients have a proven track record in creating leaders, engaged employees and productive organisations. We offer customised models and programmes as well as the option for clients to create a bespoke programme using our accredited courses. 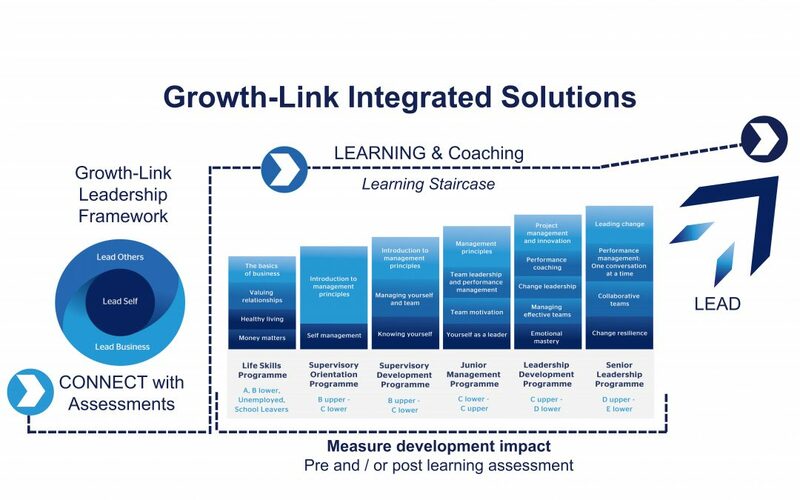 The coaching, workshops and programmes developed by Growth-Link Integrated Solutions follow your development paths for the benefit of your people and your business over both the long and the short term. Our stable of products includes customised modules and programmes, a blend of leadership products for senior and executive management and we also have the option for you to build your own programmes from our range of accredited courses.